As college admissions letters crisscross the country, we wonder about standardized testing. Do the SAT and ACT accurately anticipate college success? Are they essential gauges of a student’s potential and ability? Aye, says the College Board, which administers the Scholastic Aptitude Test to about 1.66 million high school students each year. 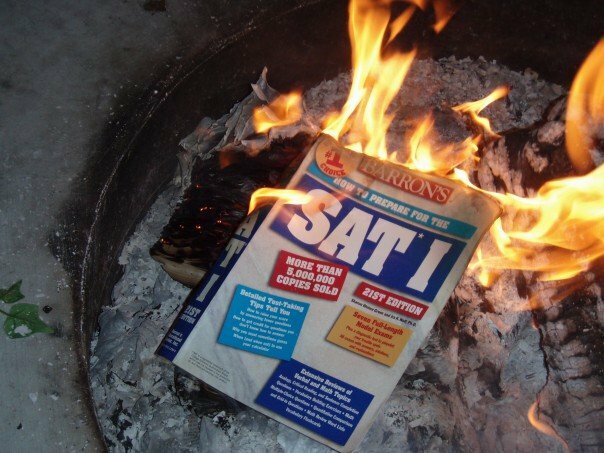 “The SAT is among the most rigorously researched and designed tests in the world and dozens of internal and external studies show that the SAT is a valid predictor of college success for all students,” wrote Katherine Levin of the Board’s communications office. The SAT costs $51, but she adds that between the SAT and advanced placement tests, the Board waives a total of more than $70 million in fees each year. Nay, say a cadre of skeptics, who say standardized tests exclude intelligent students whose abilities are not measured well on the tests. A recent study of 123,000 students at institutions where standardized tests are optional found that non-submitters had an average college GPA (grade point average) just 0.05 below those who did report test scores for judging during admission. Graph shows the percentage of all 18- to 24-year-olds enrolled in college (excepting those who are in the military or prison). Trends in Higher Education Series, Copyright © 2013. The College Board, with permission. College graduation rates were also close: test submitters were just 0.6 percent more likely to graduate than the non-submitters. “That’s nothing,” says William Hiss, the principal investigator. “What was surprising is how consistent the data has been,” he adds. Hiss, who recently retired as long-time dean of admissions at Bates College in Maine, says the GPA and other aspects of the applicant’s high-school years are much better predictors of success. Bates ceased requiring standardized admission tests in 1984. His studies of student performance at Bates mirrored his national study, Hiss says. “I was also pleased, and a little surprised, that … the non-submitters turn out to be, in higher percentages, members of all the subgroups that folk wisdom would tell you have not been helped by standardized tests: first generation to college, all categories of minorities, Pell grant recipients [who meet federal low-income standards], LD [learning differently] kids and marginally more women.” After looking at records from 33 public and private undergraduate institutions, the study found “few significant differences” between students who did and did not submit test scores. At the six universities under study, students who did not submit standardized test scores graduated at higher rates than those who did submit their scores. Credit: modification of graph by Hiss et al, 2014. Absolve us. We could not resist using a classic “SAT-word,” from the test’s venerable vocabulary interrogatories (a category whose imminent metamorphosis will occur in 2016). A third group comes down in the middle, averring that standardized tests facilitate better decisions. “I advocate using standardized tests for admission purposes, but think we need to change our expectations,” says James Wollack, associate professor of educational psychology and director of testing and evaluation services at the UW Center for Placement Testing at the University of Wisconsin-Madison. cat·er·waul verb 1) to make a loud, unpleasant sound, like a cat in heat 2) to protest or complain noisily. And even though most American colleges and universities still use one test or the other, a critical organization called Fairtest lists 800 schools that do not require them for admission, and says the “test-optional” list is growing. 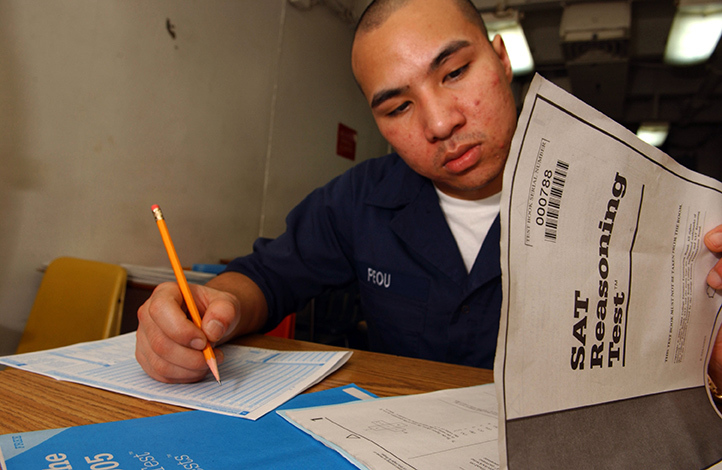 Seaman Chanthorn Peou of San Diego, Calif., took the SAT aboard aircraft carrier USS Kitty Hawk, as part of the Navy’s continued education services. Washington State assures admission to any student (in-state or out) who has, in college preparatory courses, earned a 3.5 GPA or is in the top 10 percent of the class. Test submitters are compared to two categories of non-submitters. In all three groups, college cumulative GPA closely tracks high school GPA. 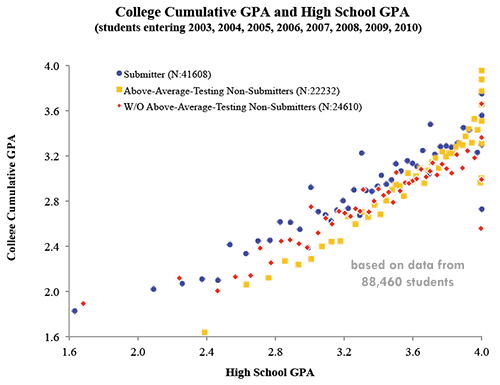 Rollover: The association is much looser when college GPA is graphed against SAT scores, showing that the SAT is less reliable than high school grades for predicting college cumulative GPA at these institutions. From original graphics courtesy Hiss et al, 2014. At UW-Madison, all undergrad applicants must submit a score for SAT or ACT, says Adelle Brumfield, director of admissions. “In our holistic review [of applicants], the score is one of many factors we consider. Fundamentally, the most important consideration is the student’s academic record. We look at the strength of the program and performance in class. We believe these are great indicators of the level of preparation that we can use to determine how they might fare” at UW-Madison. Although “aptitude,” or the ability to learn, is tough to measure, and the current term, “assessment,” is pretty nebulous, the SAT does not purport to gauge what students have learned in high school. SAT test-prep books on a shelf at a Barnes and Noble store in New York City. In 2016, applicants will be able to get free, online help for the revised SAT. In 2013, the College Board reported that 5 percent of test takers cited a “disabling condition,” but that only 2 percent got an “accommodation,” such as a Braille exam or extra time to complete the test. The critical reading, math and writing scores were below the 50th percentile among both groups, although it’s unclear whether that signifies low academic potential, poor testing ability, or the Board’s refusal to “accommodate” 60 percent of the subjects who claimed disability. 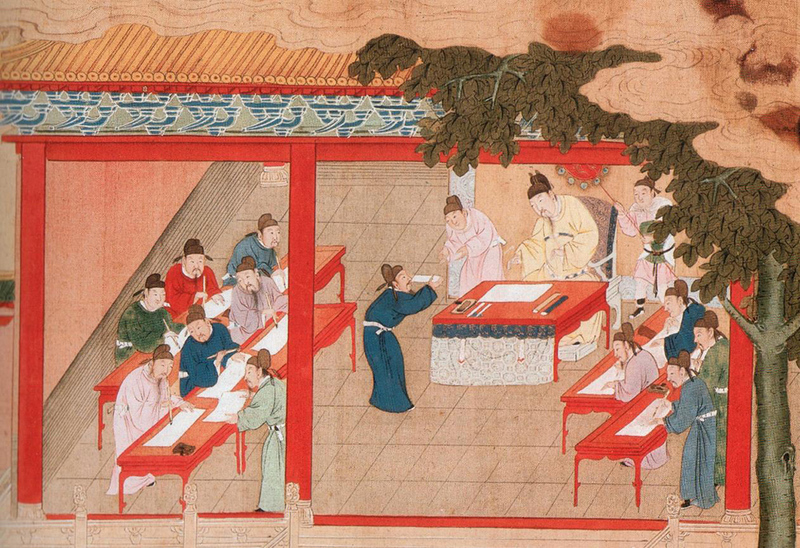 A Song Dynasty (960 – 1279) painting of candidates taking the imperial examination, a rudimentary test in China. Gunpowder, invented during the Song Dynasty, did not prevent its defeat by the Mongols in 1279. 11th grader Suzane Nazir studies for the SAT in Florida on March 6, 2014, one day after the College Board announced another redesign of the SAT. The redesign will render optional the essay, a key insertion to the 2005 revision. • A focus on the meaning of relevant words in context, rather than rote memorization of obscure words with scant real-world utility. • A requirement that students support their assertions by referring to provided text and graphics from the humanities, science and social studies. • An optional essay whose prompt will be released in advance; the student must comb the evidence supplied to support the essay. • A math test that will focus on problem solving and data analysis, the “heart of algebra,” and the “passport to advanced math.” — areas that, the Board says, are proven to college success. To reduce the advantages of wealth, the College Board will partner with the Khan Academy to provide free, online test preparation. Early opinions offered to The Chronicle of Higher Education differed1. Tests are a fact of life in most educational systems: Students on a compound outside the school take end-of-year exams in 10th class math. 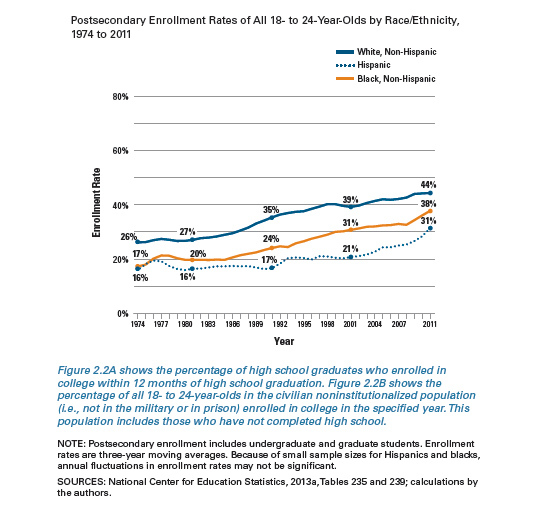 Minority enrollment soared after Bates College made standardized tests optional in 1986. Study author William Hiss says that at Bates, submitters and non-submitters show “no major differences” in employment in business, finance and media, where high-stakes tests have little clout.